3 Hes interested in what Im saying! Wow, Im so interesting! What Im saying is really interesting! Tom Bob I am SO not interested! He is boring me to death! Would someone please just get me out of here?! 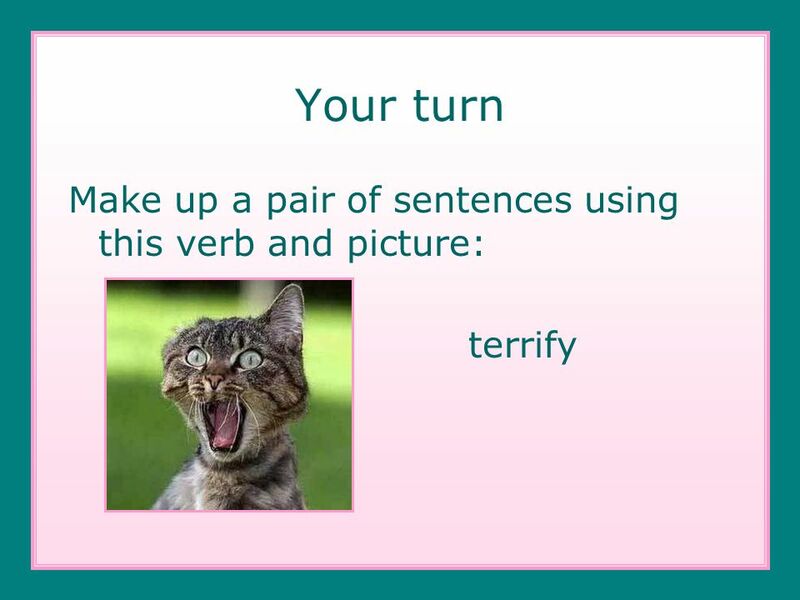 Have you ever been in a situation like this? 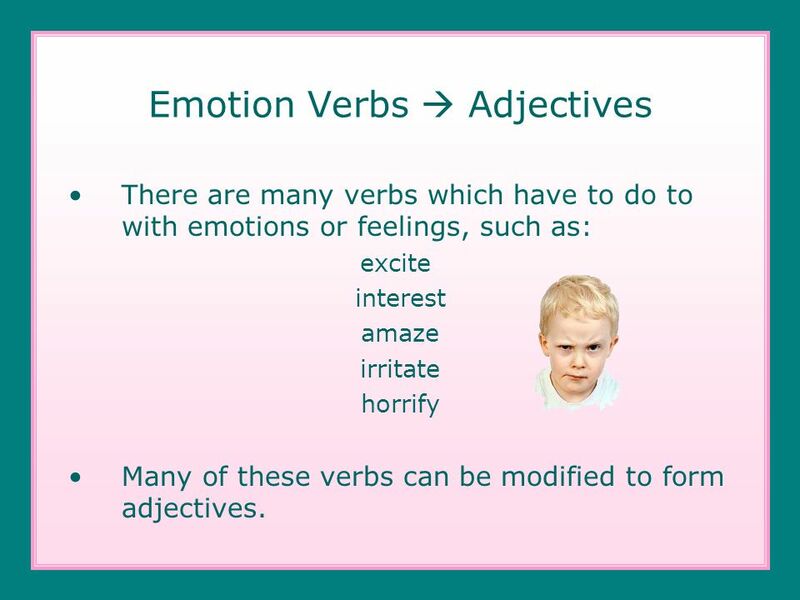 4 Emotion Verbs Adjectives There are many verbs which have to do to with emotions or feelings, such as: excite interest amaze irritate horrify Many of these verbs can be modified to form adjectives. 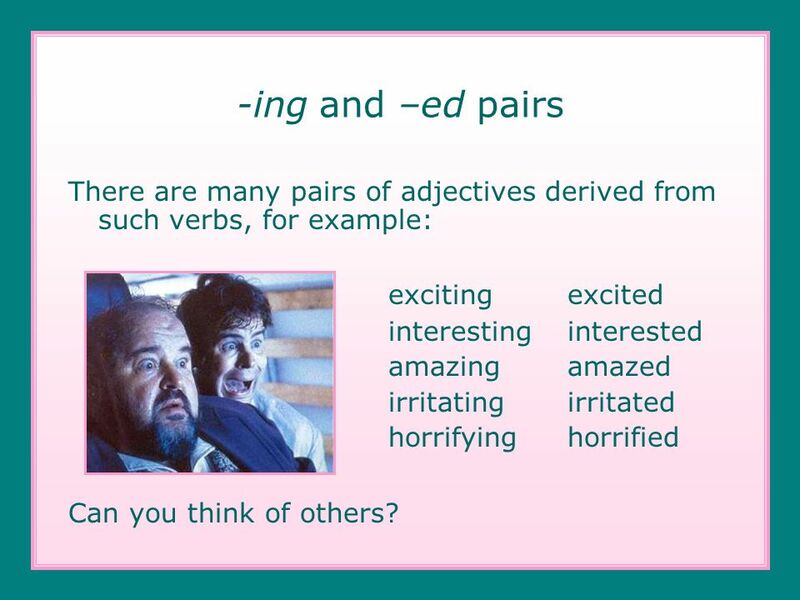 5 -ing and –ed pairs There are many pairs of adjectives derived from such verbs, for example: exciting excited interesting interested amazing amazed irritating irritated horrifying horrified Can you think of others? 7 Source A Source can be a thing or a person. 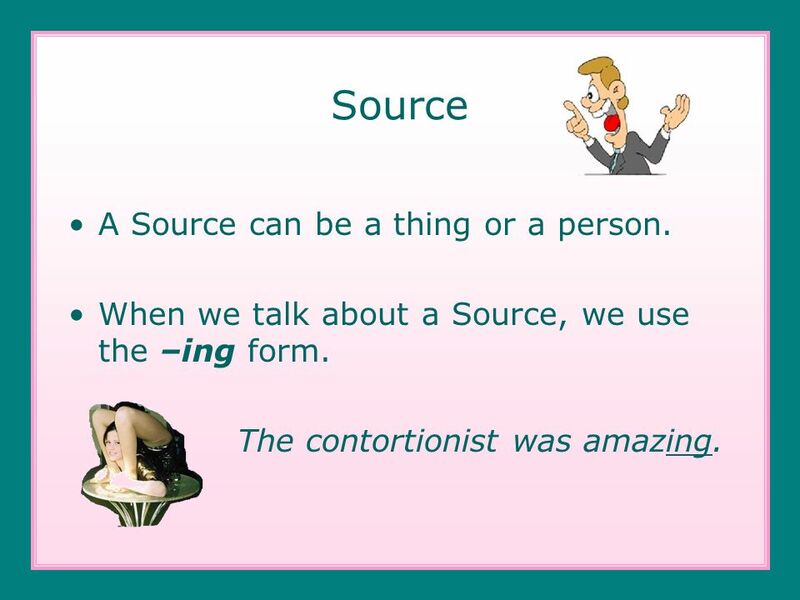 When we talk about a Source, we use the –ing form. The contortionist was amazing. 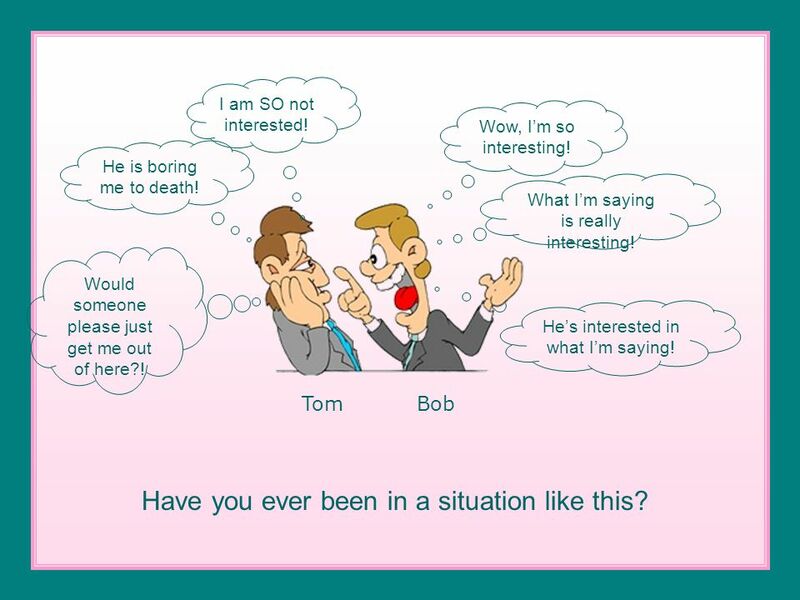 8 Experiencer Usually an Experiencer is a person. 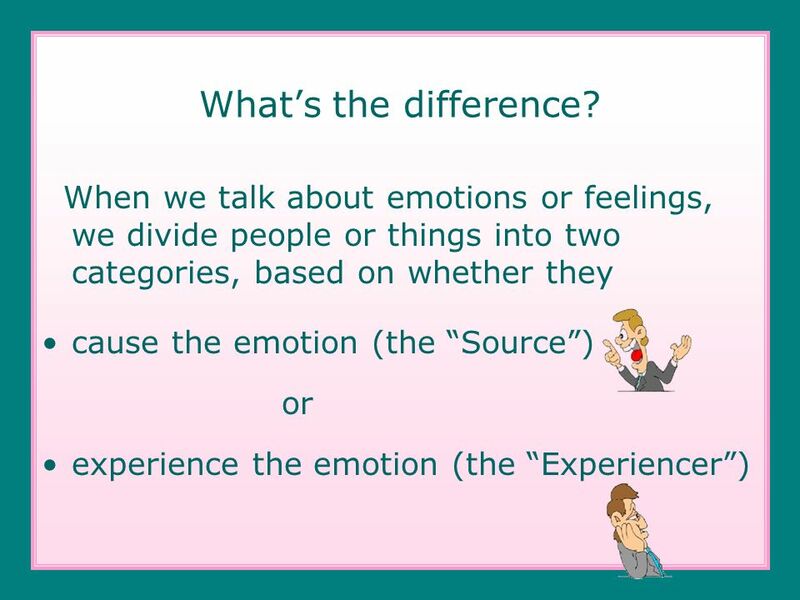 An Experiencer experiences the emotion or feeling. An Experiencer is affected by the Source. 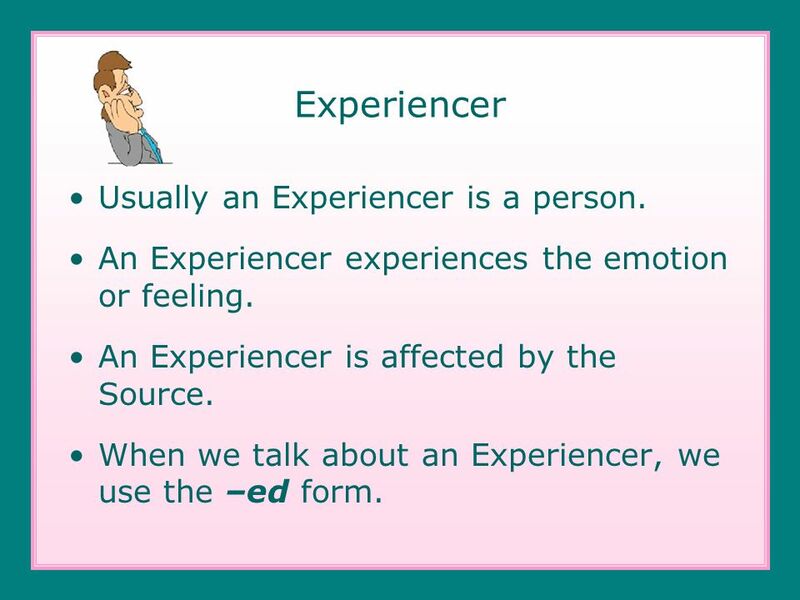 When we talk about an Experiencer, we use the –ed form. 10 frighten The movie is ________________. The girls are ________________. 12 amuse This family is ________________. 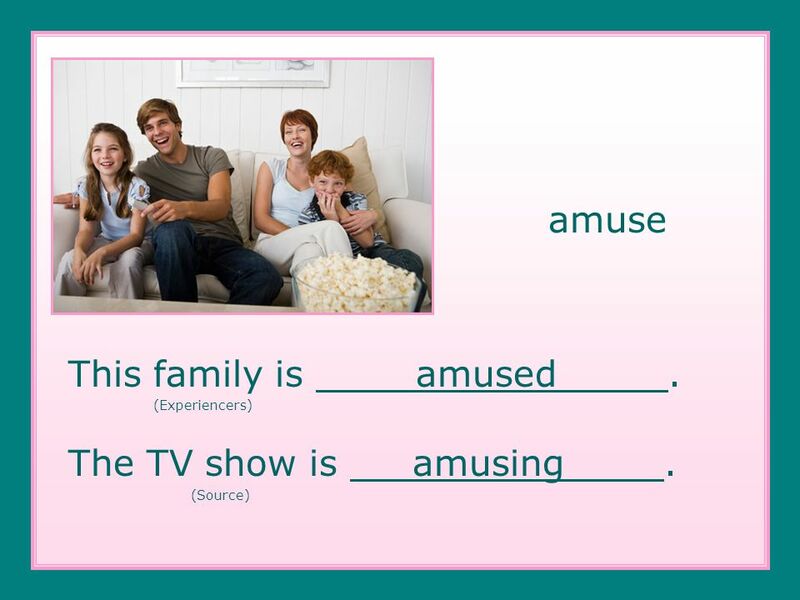 The TV show is ______________. 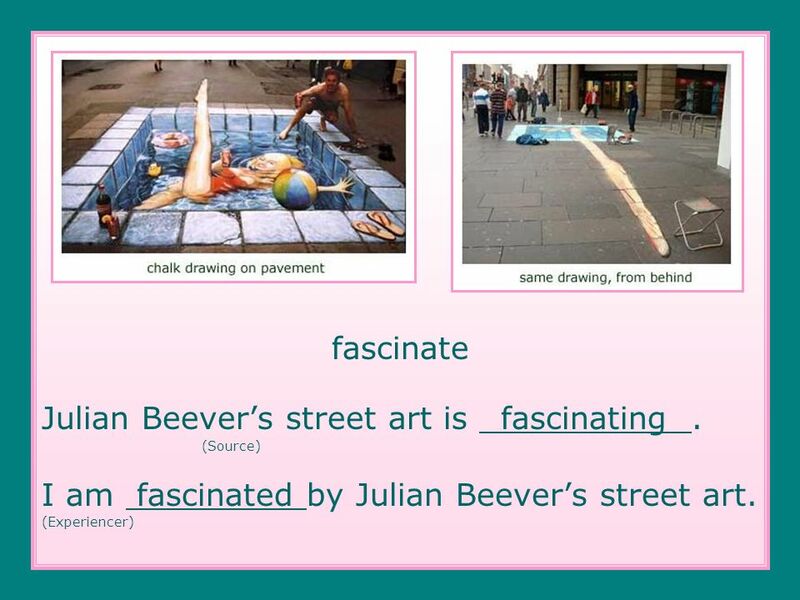 14 fascinate Julian Beevers street art is ____________. I am ________ by Julian Beevers street art. 16 frustrate The woman is _______________. The computer is _____________. 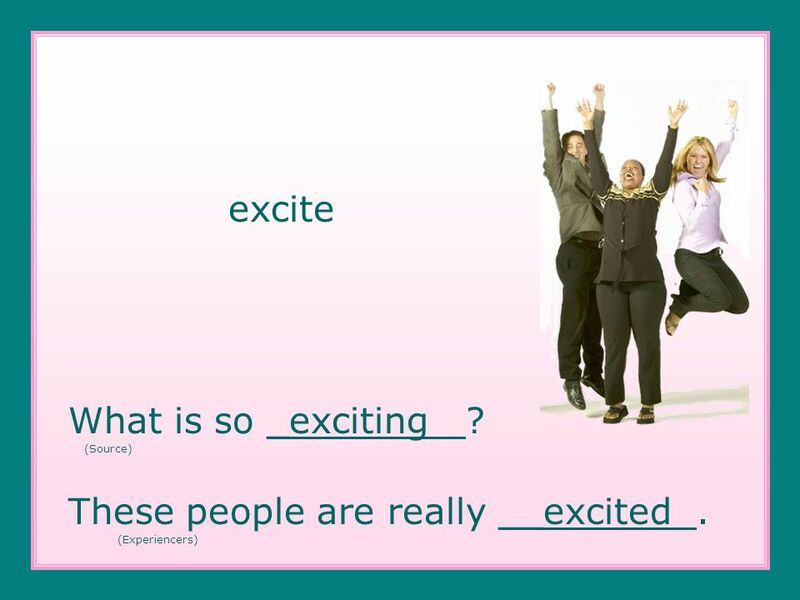 18 excite What is so ___________? These people are really _________. 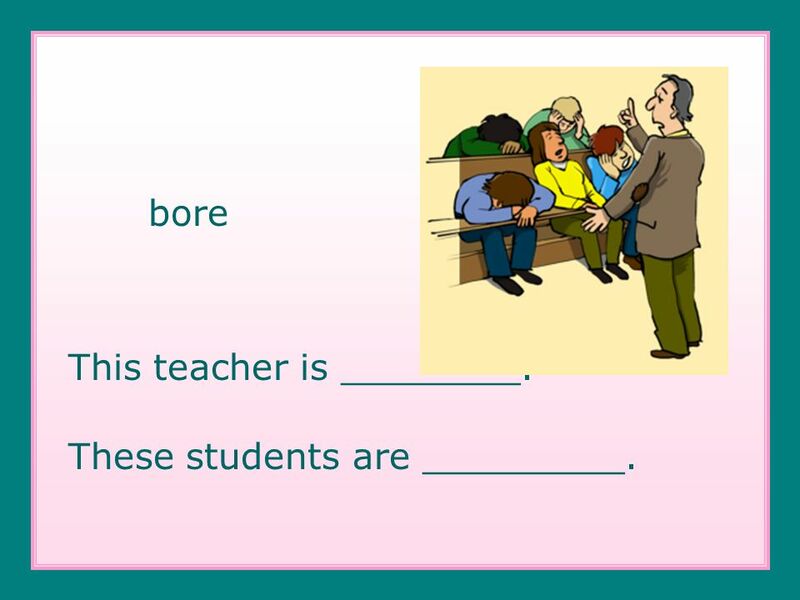 20 bore This teacher is ________. These students are _________. 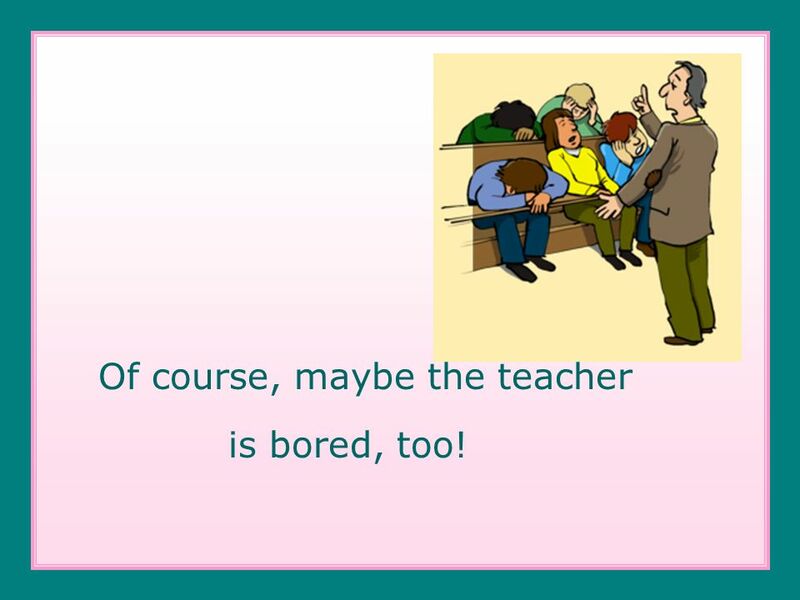 22 Of course, maybe the teacher is bored, too! 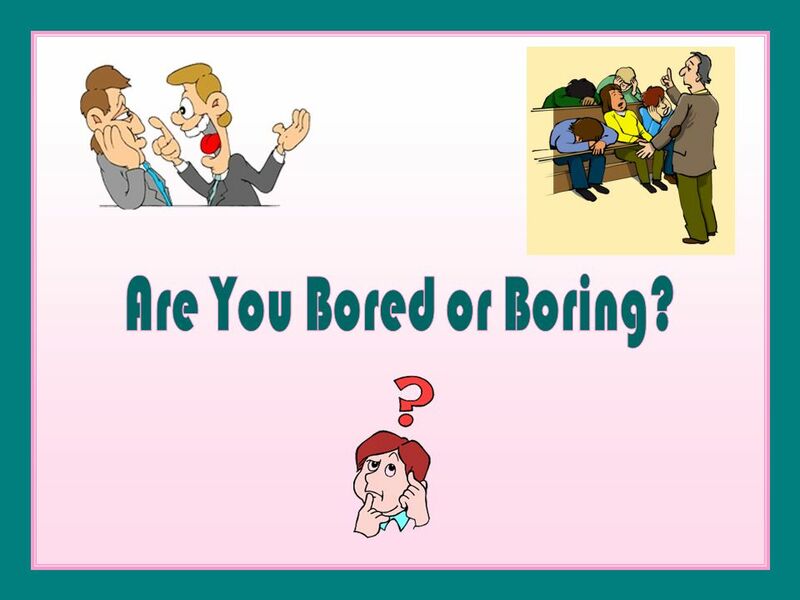 Download ppt "What is happening in this picture? What do you think Tom is thinking? Bob? Tom Bob Blah, blah, blah… Mm m mm m m …"
1. Greatly surprised; astounded; suddenly filled with wonder. A. Amazed B. Amused C. Alarmed D. Fascinated. Talking about things The test was confusing, frustrating, tiring..... The situation was embarrassing, disgusting, depressing, frightening.... The. 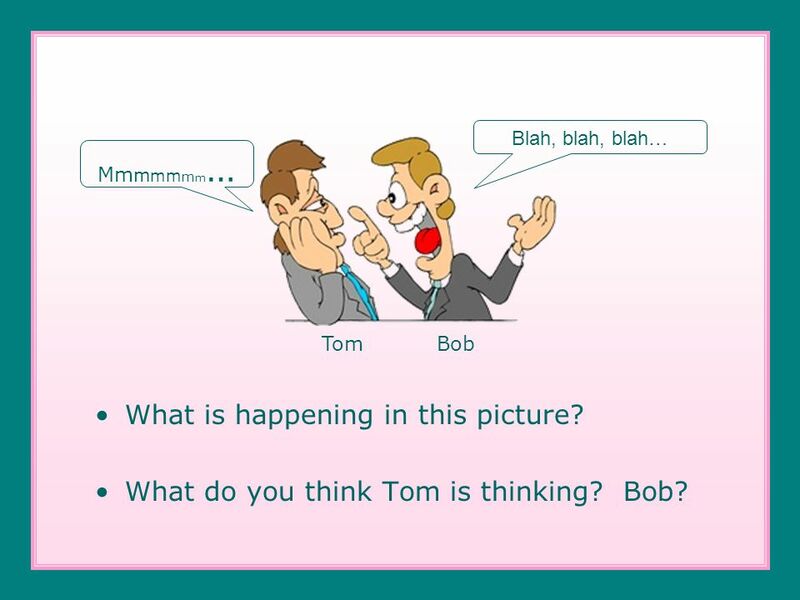 Unit 8ª page 88 I hate weekends Aim: Talking about you like or don´t like doing on weekends Agenda Review and check page 86 Lead-in Reading Grammar Vocabulary. Produced by the Riverina Schools Project Partnership, 2009 Talk To Me Lesson Six How To Start a Conversation Revision. A DJECTIVES - ED VS. - ING. -ED if you want to describe a feeling I’m very interested in rock music ING if you want to describe people or things Rock. Let’s have a parti (ciple )!!! 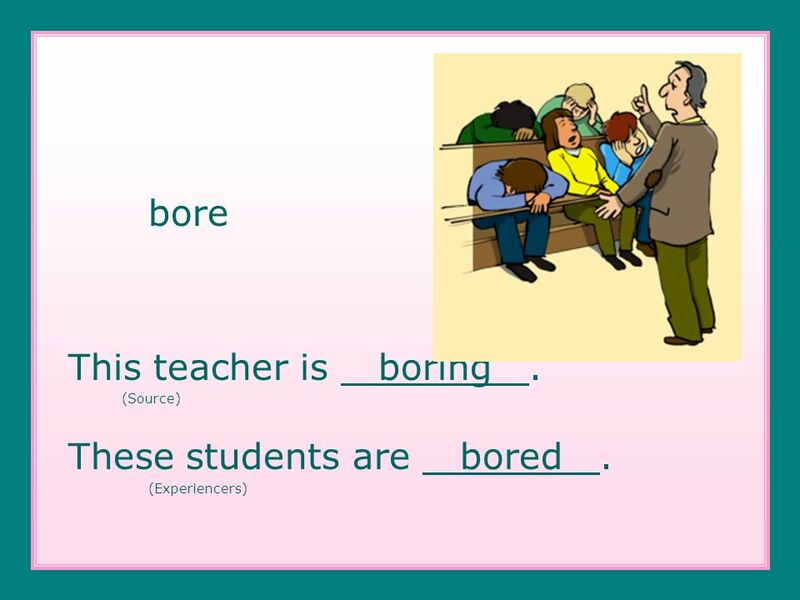 Using –ing and –ed adjectives to increase verbal repertoire (participial adjectives) ESL English Learner Wednesdays/Fridays. 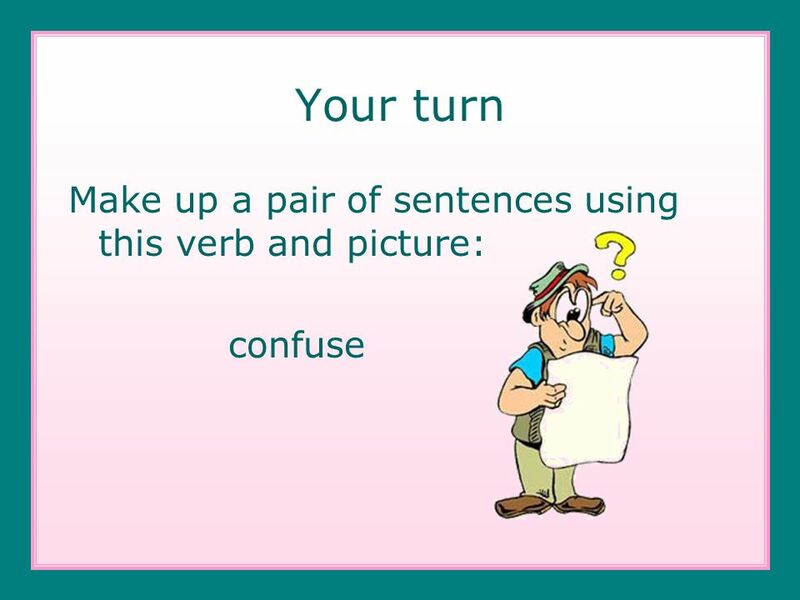 GRAMMAR Common mistakes that you will no longer make…? Yabancı Dil- II Bölüm ADJECTIVES ENDING IN -ED AND -ING. Of the holidays. To create an interesting recount.